Big fish are overrated if you ask me. The giant tuna, sea bass and kingfish filets and steaks may be meatier but it’s the small fry that score big on taste, nutrition and sustainability. Fish recipes must focus on everyday catch that have traditionally been a vital part of our diet but are largely ignored these days for more expensive, imported, boneless, supermarket fare. This post on Fresh Anchovies With Coconut celebrates the little denizens of the ocean. All along India’s western shores, coastal communities have thrived on sardines, anchovies, mackerel and such that comprise the bulk of the daily catch. Local fisherman go out on their long boats and haul in nets shining with these rich, oily fish. In states like Kerala, healthy fish recipes passed down from generations are based on sardines and anchovies. Cheap, plentiful and rich in Omega-3, they take credit for making up the protein component and brain food in the Keralite diet. Apart from the staple coconut, these fish are the reason why people from the state are thought to possess higher-than-average levels of intelligence and a healthy growth of black, slow-to-grey hair. Lower in mercury than most other fish, fresh anchovies and sardines are dense with Omega-3 fatty acids and rich protein. According to the USDA, they are fantastic sources for iron and vitamin B-12, phosphorus, niacin and selenium. I mean it’s just common sense to include them back in our diet – it’s definitely a more delicious way of loading up on Omega-3 than popping capsules. What I like about eating anchovies is that, when fried, their bones go all crunchy; eaten with hot, steamed rice, they pop like salty fish crispies…yummy! That’s real nose to tail food for you. The other day at the fish market, feeling serendipitous seeing beautiful mounds of sparkling fresh, silvery-white anchovies, I was loathe to fuss around too much with them. 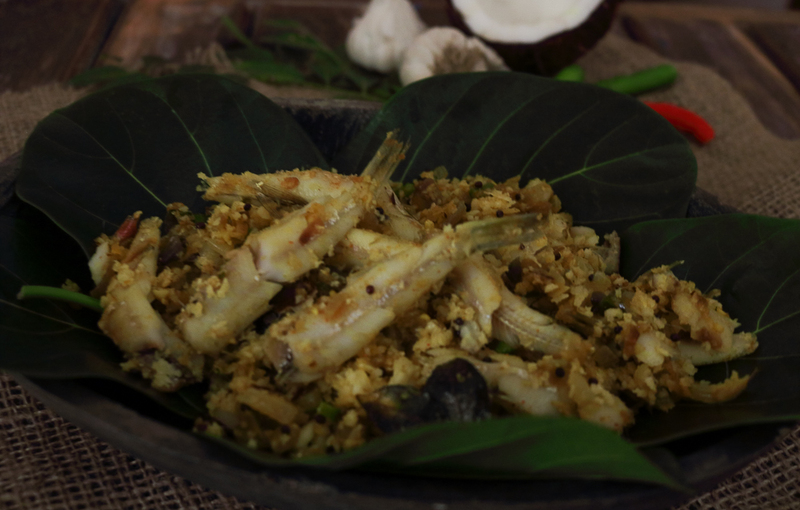 In my fish recipe, they are sauteed lightly with sweet,coconut oil and juicy, just-grated coconut, they remained pristine, and just perfect. With a smattering of minced young ginger, garlic,curry leaves, green chillies and shallots, this light, 10-minute healthy fish dish is practically a salad. Eat it as you fancy. Anchovies(nethili in Tamil and Malayalam, nethallu in Telugu and kati in Hindi and Marathi) are easy to clean and prepare if your fishmonger doesn’t have the time. All you have to do it scale gently with a thin knife from tail to head, discard the head (or keep it if you prefer), make a small slit on one side and scoop out whatever little guts there may be before you wash and drain the fish. I always retain the tail – why waste a crackly tidbit at the end of the delicate fish. The anchovy has a single bone running down its middle, which is loosened once the fish is cooked and comes away neatly in one piece while eating. No stress of pin-boning and no danger of swallowing any spines. So if you get them fresh where you live, do try them. Delicate and very different from the high-sodium tinned anchovies, you’re sure to become a fan of this little white fish. 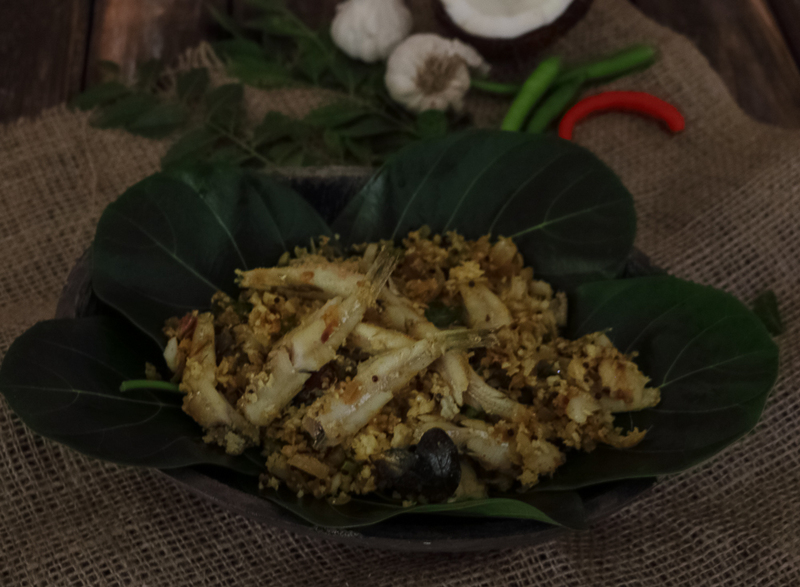 A quick,light and delicate saute of whole, fresh anchovies with ginger, garlic, curry leaves and just-grated fresh coconut. Heat 2 tbsps of coconut oil in a pan on medium heat and throw in the mustard seeds. As they crackle, reduce the heat and add the curry leaves followed by the shallots. Saute for a minute or two till translucent but not brown. Now put in the ginger, garlic, green chillies and turmeric powder and cook for 20 secs more. Gently tip in the fish and stir to coat with the other ingredients. Mix lightly so as to avoid breaking the delicate fish. Cook for 5-7 minutes and add the salt and grated coconut. The fish will be done at this point. Saute for a minute more, drizzle the remaining tbsp of coconut oil on top and take the pan off the heat. Serve hot or at room temperature.